The Kaora people are mostly landless. They work as agricultural laborers and fish farmers. Some raise pigs and goats while others are drummers, rickshaw-pullers or palanquin-bearers. They do not have many educational opportunities, and they suffer from illiteracy. Their girls get married between the ages of 12-16, and boys are married at 20-25. Women have very low status in Kaora communities. The Kaora people are entirely Hindu, worshiping a variety of Hindu gods and goddesses. They cremate the dead and place the remains in a river. 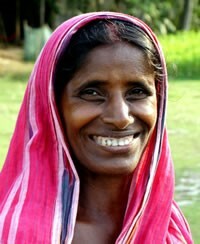 Most Kaora live in India, but a small contingent lives in Bangladesh. The literacy rate is low among these people, so the Gospel needs to come to them in oral as well as written forms. Perhaps workers who can tell stories from scripture will be led by the Lord's Spirit to these people, in both Bangladesh and India. 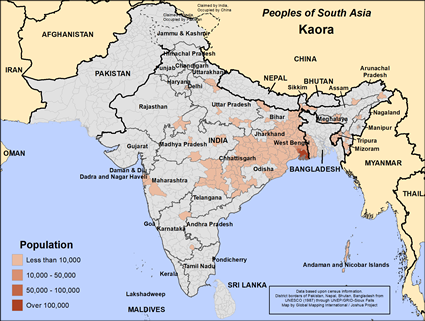 Even though there may be no followers of Jesus today among the Kaora in either Bangladesh or India, we can trust there soon will be many such followers. Pray for this to occur. Please pray for a rising literacy rate among this people group, and for improving employment opportunities. View Kaora in all countries.